If you have a Facebook account and a few minutes to spare, check out this amazing collection of pictures of Oshkosh as it used to be. Park 'N Print of Oshkosh has been gradually building an album named Historic Oshkosh on their Facebook page to the point where it now includes 186 images of Oshkosh from decades past. If you live in Oshkosh there’s sure to be a few things in there that’ll catch your eye. You can reach the album via this link. If you’re not on Facebook, here are a few samples from the album concerning Oshkosh’s beer brewing past. Here’s a picture of the Oshkosh Brewing Company as it would look if you were approaching the brewery from the south-east corner. That looks like a large pile of spent grain in the foreground. 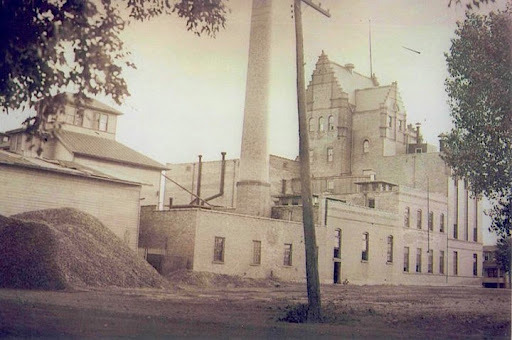 Here’s the Oshkosh Brewing Company again, this time looking south from the corner of W. 16th Ave. and Doty Street. This is probably from the mid-1980s. The brewery was demolished in 1986. Here’s a picture taken at the Rahr Brewing Company on Rahr Avenue. This looks to be from the late 1940s or early 1950s. 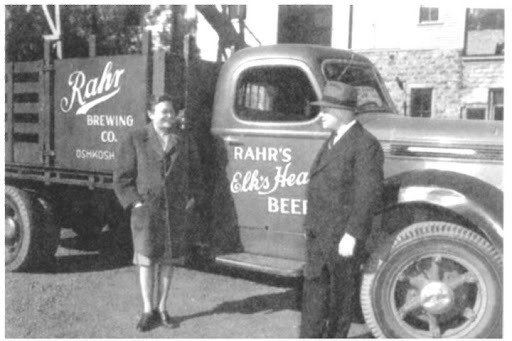 That’s Blanche Rahr and her brother Carl Rahr, owners of the brewery. Wouldn’t it be great to see these last two driving down your street! 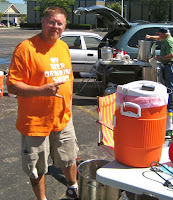 The Oshkosh Beer blog went online exactly one year ago today. One hundred and ninety-five blog posts later, we once again find ourselves, with liver aquiver, gazing upon yet another selection of choice tap handles. Let’s get to ‘em. It’s been 25 years since the last time Oblio’s brought in a barrel of what may be the worlds finest doppelbock and who knows when they’ll roll in the next one, so as beer freaks we all owe it to ourselves to get down there and drink deeply from the faucet currently drawing Paulaner’s Salvator Doppelbock. This is Bock supreme! A strong, full-bodied lager with a gale of toffee aroma and an incredibly rich malt flavor. Skip your next meal and indulge yourself in this delicious loaf of liquid bread. If you’re craving a bock that’s a little less chewy, Barely and Hops has what you’re looking for. Nate recently brought in the New Glarus Cabin Fever Honey Bock. 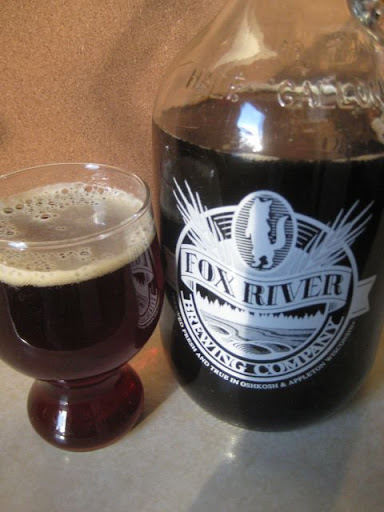 This is a much lighter bock that hearkens back to the traditional bocks of Wisconsin. A nice, easy-going, malt-forward beer that’s good for multiple pints. All right, just because we’ve got all these bocks around town, doesn’t mean Spring is here. We’re still deep in winter, the season for imperial stouts. 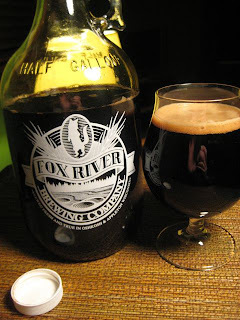 At Fratellos’ Fox River Brewing they recently tapped their always welcome Vader Imperial Stout. It’s been a year since the last time this was available in Oshkosh and this year’s version is choice. It’s a true Russian Imperial Stout, that pours pitch black and comes on big with the deep flavors of dark fruit and roasted malts. There’s a bit of alcohol in the finish to warm you up, too. Check out Brewmaster Kevin Bowen’s notes here. One last stop: You’ve got to get over to Becket’s. They have a slew of new beers on and a couple you shouldn’t miss. Ommegang’s Abbey Ale, a great, American-brewed Belgian Dubbel, is pouring and they’re serving it up in a glass that’s perfect for the beer. I wish more places would show that kind of respect for their beer (and I wish less people would steal their beer glasses when they do). Also at Becket’s is Southern Tier's Old Man Winter Ale. Here’s another full-bodied, malt-laden winter brew that features a serious dose of American hops. But those punchy hops match perfectly with the beer’s big malt flavor. The balance of this beer is phenomenal making its 7% ABV drift by virtually unnoticed... until later. So that’s the get-the-hell-out-of-the-house edition of this week's beer round-up. Beer is a convivial beverage, friends! Support our local good beer joints by getting out there and enjoying it in the company of your fellow quaffers. Prosit! Seventy-Six years ago this week, Americans began putting beer in cans. On January 24, 1935 Krueger Brewing of Newark, New Jersey became the first American brewery to can its beer. And by the 1940s, the Oshkosh Brewing Company was doing the same. 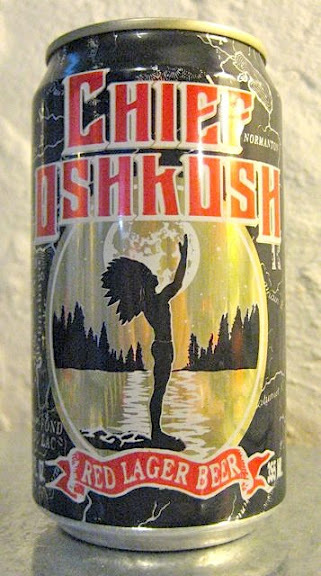 Oshkosh Brewing was the first brewery in Oshkosh to can a portion of their beer, using cans with cone shaped tops. The protruding top of the can made it possible to fill them using modified bottling equipment and thus save the expense of a separate packing line for their canned beer. For smaller, regional brewers such as those in Oshkosh, canned beer was something of a menace. It added additional expense to their operation and made it increasingly easier for larger breweries to flood their market with beer. Canned beer maintained its freshness longer and was cheaper to distribute than bottled beer, virtually eliminating the geographical advantages the small breweries relied upon for their survival. By the 1950s canned beer was omnipresent. The brewers of Oshkosh had to either adapt fully or go under. In 1955 the Oshkosh Brewing Company took the plunge by purchasing a new canning line and converting to the more familiar flat-top can. A year later, The Rahr Brewing Company of Oshkosh, which never made the jump to cans, went out of business. 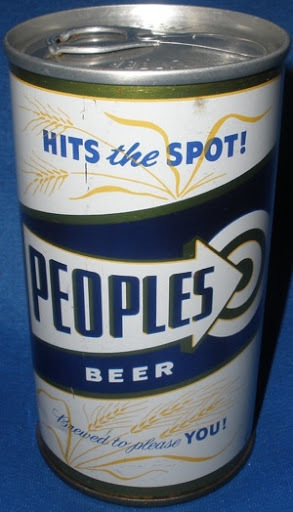 The Peoples Brewing Company of Oshkosh would be a late adopter to canning, holding out until 1963 before introducing its beer in cans. But for the brewers of Oshkosh, canned beer was a losing proposition. 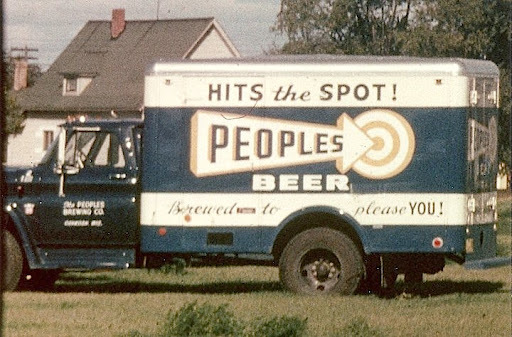 In the end, it represented one more competitive advantage that the large beer makers used to drive under small, local breweries like those here. There is a bright spot to the story of canned beer in Oshkosh, though. 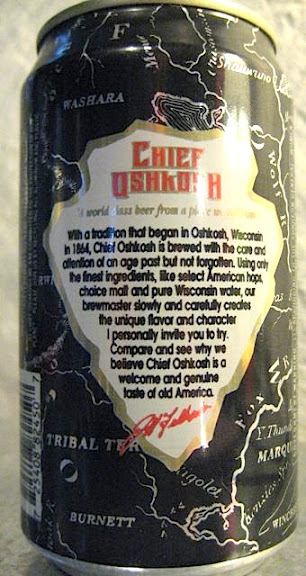 In June of 1991, Chief Oshkosh Red Lager by the Mid-Coast Brewing Company of Oshkosh became the first American craft beer packaged in cans. The beer was years ahead of a trend that is only now coming to prominence. There are now more than 100 American craft brewers canning their beer, but when Jeff Fulbright, President of Mid-Coast brewing, started the ball rolling 20 years ago, craft beer in a can was a hard sell. “Back then, the idea that great beer doesn't come in a can hurt me,” Fulbright says. There were, however, others who appreciated Fulbright’s effort. 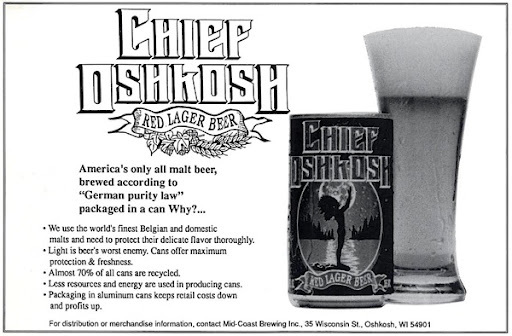 In 1992 The Beer Can Collectors of America chose the handsome Chief Oshkosh Red Lager can as their can of the year. The beer may be gone, but the can still looks great today. 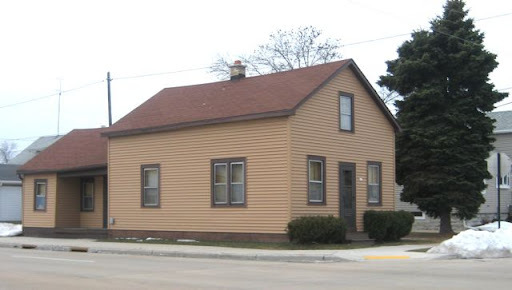 Though last week’s post about Theodore Schwalm ended on a dour note, his death did not impede the rise of the beer-brewing Schwalm family in Oshkosh and beyond. Arthur L. Schwalm was just two-years-old when his father, Theodore Schwalm, died in 1888. But like his father, Arthur was destined to become a beer man. His path to the beer business was nothing like his father’s, though. Prior to his brewery days, he attended the Oshkosh Teacher's College and then the University of Wisconsin where he earned a bachelor of arts degree and was captain of the football team. 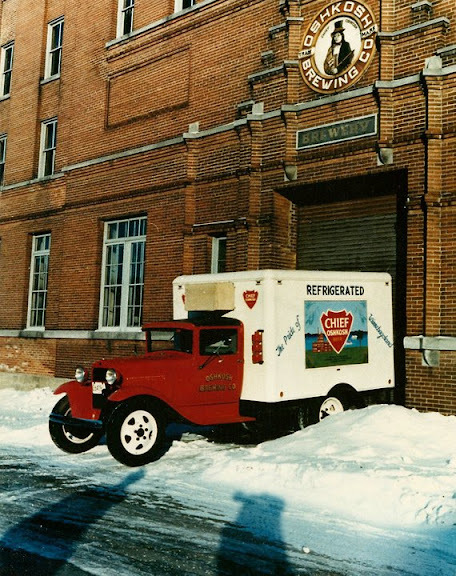 When he returned to Oshkosh, Arthur went to work in the bottling plant of the Oshkosh Brewing Company. 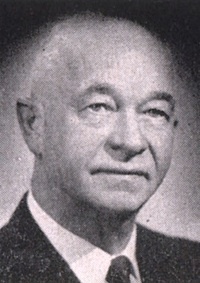 He stayed with the company through the bleak years of Prohibition, eventually becoming vice-president of the brewery and in 1942, following the death of Otto Horn, was made president of the Oshkosh Brewing Company. 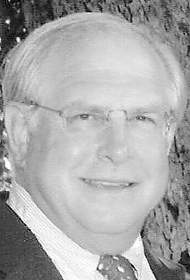 Arthur L. Schwalm was 56-years-old. He managed the brewery through its most expansive period and gained a prominence within the larger brewing community that few regional brewers enjoyed. He was vice-president of the Wisconsin Brewers Association and a director of the American Brewers Association. He would also be the last member of the original families who formed Oshkosh Brewing to lead the company. When Arthur died in 1961 at the age of 76, he was still president of Oshkosh Brewing. The obituary that appeared for him in the Oshkosh Northwestern mentions that his interest in brewing was probably sparked by his grandfather, Leonhardt Schwalm, whom he never met. The piece omits any influence his father, Theodore Schwalm, may have had upon him. Two months after Arthur’s death, the company was sold to David V. Uihlein, of the family who controlled Milwaukee’s Schlitz Brewing. From the vantage point of the 1940s, that ending to the story would have been entirely unexpected. Arthur Schwalm had groomed his son, A. Thomas Schwalm, to follow him into the beer making business and for a time, that’s the path he trod. 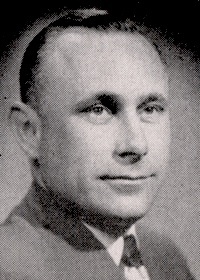 After Graduating from the University of Wisconsin, A. Thomas Schwalm was trained as a brewer and was brewmaster for the Oshkosh Brewing Company through the 1940s. But A. Thomas Schwalm’s brewing days came to an abrupt end in 1950 when his father-in-law, Oscar J. Hardy, died. Hardy was the owner and publisher of the Oshkosh Daily Northwestern and when he passed, A. Thomas Schwalm left the beer business and took over the paper with his brother-in-law, Samuel W. Heaney. Together they ran the Northwestern as co-publishers until 1994. A. Thomas Schwalm passed away in 1997. The following year the Northwestern was sold to Ogden Newspapers. There was still beer in the Schwalm blood, though. A. Thomas Schwalm’s son, Thomas Hardy Schwalm, would follow the paternal tradition and establish a career in the beer business working for Schlitz, Strohs and in 1994 he became president of Barton Beers Ltd., then the largest independent beer importer in the United States. But Thomas Hardy Schwalm’s real claim to fame would be the SoBe line of teas and energy drinks. Yes, those big bottles filled with glowing fluid that you see at every gas station from coast-to-coast were conceived by an Oshkosh beer man. We’ve come a long way from Theodore Schwalm and the days of Chief Oshkosh Pilsner. A couple weeks ago I made mention here that Hinterland’s Maple Bock had arrived in Oshkosh. It’s an excellent beer, but I failed to note that it is also a sign of the impending cultural apocalypse. Bocks, after all, are supposed to be Spring seasonal beers, but nobody seems to care about such things anymore. Why just the other day, I was sniffing around the beer isles and was accosted by two more insolent bock brews that successfully enlisted me in their degenerate plot to undermine the decorum of our once polite society. All right, so that’s my obligatory, nonsensical rant. If you’re going to type up stuff about beer, you’ve gotta do that kind of thing from time to time. And bitching about bocks coming to market too early is an Oshkosh tradition, so I thought I ought to do my part to keep it alive. The oldest Oshkosh rant I’ve seen about the too-early bocks comes from an 1885 Oshkosh Daily Northwestern. They were complaining about it in May! It’s right next to a little article announcing that Krao the “missing link” would soon be on exhibit in our happy city. Enough, let’s get to the beer. And Bock beer it is. 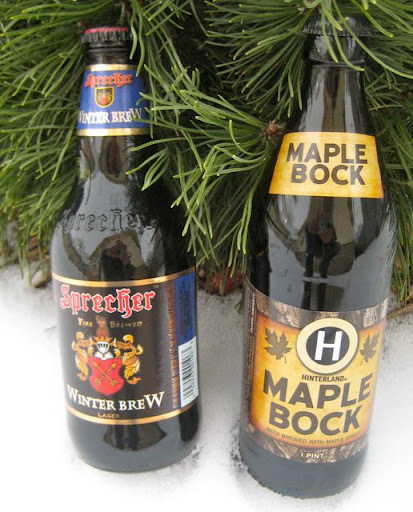 Over at Festival Foods in Oshkosh the two recent bock arrivals that will pair well with your saliva are Capital’s Maibock and New Glarus’ Cabin Fever Honey Bock. They’re both excellent brews that’ll improve your weekend if you spend some time pressing them to your face. The Maibock from Capital is a beautifully aromatic beer that reminds me of waking up to the smell of fresh bread. It’s a little towards the caramel-sweet side, just like a good bock should be, with a medium body that’s perfectly balanced by an earthy snort of noble hops that comes through in the finish. The New Glarus Honey Bock is more in keeping with the sort of bocks that used to be brewed in Oshkosh in the mid-50s. It’s a pale-gold, malt-forward brew that’s ridiculously easy to drink. There’s nothing overt in the flavor profile, just a pleasing blend of warm, dry malt with a bit of sweetness and a sneaky bitterness that you’ll have to hunt to find. Another bock that’s a good one to belly-up to is the Andygator from Abita Brewing that Dublin’s currently has on tap. This is another easy drinker that hides its 8% ABV maybe a little too well. It’s a smooth, fairly rich brew with an herbal hop ending that cleans the malt up, making for a surprisingly refreshing bock. You might want to keep an eye on Dublin’s in the coming weeks. They have some exciting beers on deck including New Belgium’s Vrienden, a funkified sour beer fermented with brettanomyces and lactobacillus. Should be interesting. One last thing and completely unrelated to bock beer: Last night I was at O’Marro’s and watched as a good part of their tap line-up suddenly converted into beers that weren’t there when I walked in. Check out the updated Tap List and if you drop-in get at least one pint of the Honker’s Ale. It’s a classic ESB from Goose Island and the keg they’ve got on at O’Marro’s tastes fantastic. We should have more about O’Marro’s next week as Shawn is going to start bringing a round of beers that haven’t poured in Oshkosh before (if you like Belgians, you’re gonna love it). It’ll be posted here when it happens. Happy weekend! Theodore Schwalm’s life could have become one those stories that people in Oshkosh used to love to tell. The only son of German immigrants, he was born into circumstances that were less than ideal, yet ripe for success on a scale his forefathers could have hardly imagined. Sometimes, though, it just doesn’t work out the way it’s supposed to. 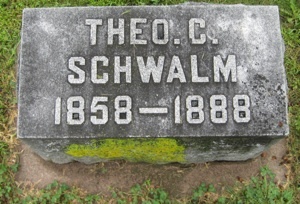 Theodore Schwalm was born in 1858, to Leonhardt and Maria Schwalm. When he was 8 years old, his father and August Horn established Horn and Schwalm’s Brooklyn Brewery on Doty Street just south of W. 16th Ave. That brewery became Theodore’s childhood home. 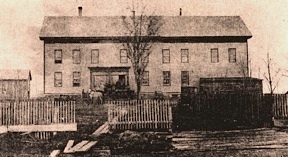 Both the Horn and Schwalm families lived there along with a host of the brewery’s workers and when Leonhard Schwalm died in 1873, Theodore became the presumptive head of the Schwalm household. He was fifteen now and also well on his way to assuming his father’s role as the Horn and Schwalm brewmaster. At this point he’d been living at the brewery for at least 8 years and though he had attended primary school, his real education undoubtedly took place in the brewhouse. That also may have been where he learned to drink. Alcohol would compromise much of his short life, but despite his incipient problem Theodore became a full partner in the brewery by the time he was 21 years old. His tenure as joint proprietor of the Brooklyn brewery didn’t get off to a good start. 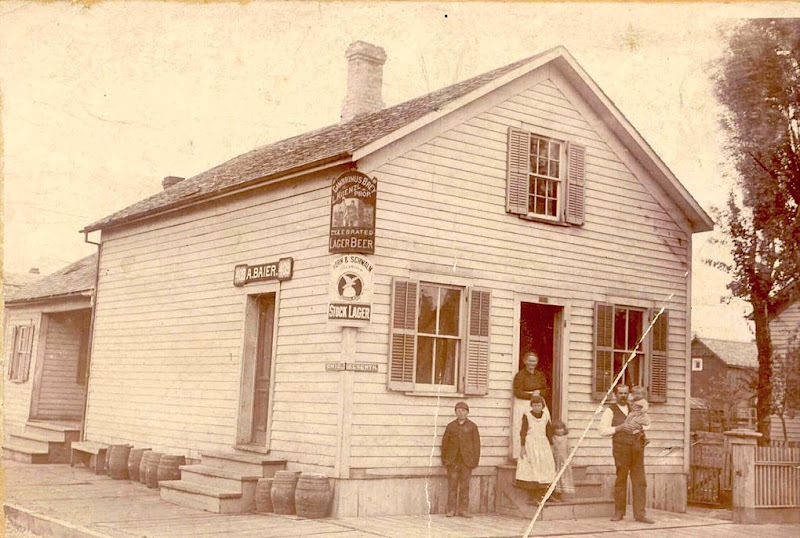 In 1879, the same year his name went on the signboard, the brewery burned to the ground. Three years earlier, Theodore, his mother, and his five sisters had moved to a new home across the street from the brewery (the house still stands at 1639 Doty Street), so although the family still had a place to live, their livelihood was in ruins. Not for long, though. 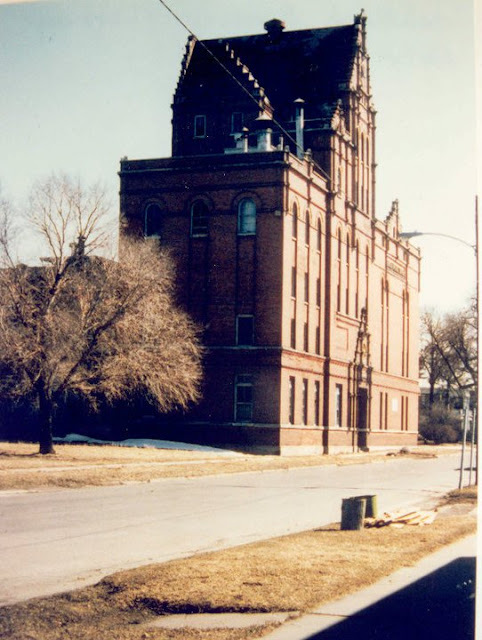 Horn and Schwalm quickly rebuilt the brewery at a cost of $35,000 and by year’s end had a brewhouse that could outpace any in Oshkosh (much of that brewery still remains along the east side of the 1600 block of Doty Street). On the face of it, things were looking up for Theodore. In April of 1881 he married and his his wife Sophia joined the Schwalm’s in their family home. Theodore’s alcoholism continued to escalate, though, and by January of 1883 he had become so debilitated that he was placed under guardianship. An abstract of the guardianship papers is unequivocal in its description of Theodore. The stark report identifies him as a “Drunkard”. Two years later, in 1885, Theodore and Sophie Schwalm had their first and only child, Arthur. But Theodore’s decline continued. By 1887, at the age of 29, he was suffering from liver failure and in the fall of that year his conditioned worsened considerably after being thrown from a buggy. On January 17, 1888, The Oshkosh Daily Northwestern reported that Theodore was gravely ill. He had been confined to his bed for the past two weeks and was not expected to live through the day. The following morning the paper reported that his condition had not changed. That evening he died. His death ascribed to “an affection of the liver”. The following Sunday, Theodore was buried in Riverside cemetery. He left behind a wife, a two-year-old son and a promising future to be claimed by others. Over the past year, I’ve been attempting to add stories to this blog about Oshkosh’s beer-soaked past. For the most part, I’ve simply been following what interests me and the result has been a grab-bag selection of Oshkosh beer history. 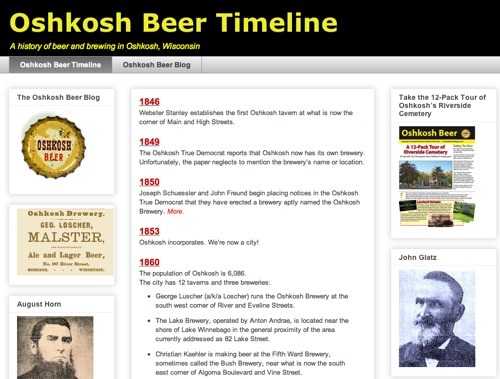 So to provide context and give a more linear shape to those stories, I've added a supplementary site named Oshkosh Beer Timeline. It’s a thumbnail sketch of the history of brewing and beer culture in Oshkosh with numerous pictures and linked side trips into more detailed realms to help flesh things out. Oshkosh Beer Timeline will continue to grow as additional stories and dates are added. A few of those stories are already in the works, but if there’s anything in particular you would like to see included, please, don’t hesitate to say so. Hope you enjoy Oshkosh Beer Timeline. It’s been a relatively quiet week on the Oshkosh beer front as the local outlets try to sell off their glut of holiday brew, but there are a few new beers that have made their way to town that you might want to soak up. At Barley & Hops they’ve recently brought Ommegang Witte in on draught. You don’t see this beer on tap very often, especially at this time of year, when the heavier winter brews predominate. This is an excellent example of a Belgian Witbier with a good amount of spicy yeast character and a wonderful creamy/sweet malt flavor. It’s refreshing as hell without being insubstantial and a nice change of pace. Oblio’s has something new on that’s a little more in keeping with winter. 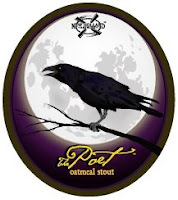 The Poet by New Holland Brewing is a classic oatmeal stout. It’s just the kind of beer you associate with January. This is a comfort beer. It has a beautifully slick texture delivering a warm and roasty malt flavor that’s balanced by just a touch of bitterness in the finish. This is an ale to spend some time with. It’s mild and easy to drink and it peaks about three pints in. And finally, Shawn at O’Marro’s says that he now has all three of the Chimay Trappist beers available in bottle. Chimay Première (Red label) is the epitome of the Belgian Dubbel; the Grande Réserve (Blue label) is the classic Chimay beer and without equal when it comes to Belgian dark, strong ales; and Chimay Triple (White label), their light-bodied 8% golden beer that’s about as dangerous as any beer made. Plant yourself in Shawn’s Irish bar and go through the entire flight of Chimay’s Belgian beer and by the time you reach the dregs you won’t know where the hell you are. You won’t care, either. It’s not every day that someone gets on a nationally broadcast radio show and talks about homebrewing and beer in Oshkosh, but Patrick Tribbey did just that on Saturday. Patrick, an Oshkosh homebrewer and member of the Society of Oshkosh Brewers, had a brief spot on Michael Feldman's Whad'Ya Know? this past Saturday wherein he extolled the virtues of homebrew while Michael Feldman cracked wise about worms and the abundance of beer in Oshkosh. This link will take you to Part 4 of the show. Dial the player forward to about the 10 minute mark to hear Patrick hold forth. So much beer. So little time. So let’s get right to it. We’ll begin over at Fratellos Fox River Brewing where every now and then Brewmaster Kevin Bowen sets out something that deviates wildly from the Fox River pattern. He’s just de-bunged Old Man Winter and much like last Spring’s Fox River Reserve, this is a connoisseur’s brew aimed at the tonsils of the local geeks. Old Man Winter is an Old Ale blended from beers one-to-three years old, aged on oak and then dosed with a brace of fresh hops. It all adds up to an excellent brew that’ll have you picking up new flavors with every draw. The beer features prominent esters wrapped around a sticky malt backbone kept in check by the bite of fresh hops and the dry, tannic aspect of the oak. Let it warm just a bit before you start in and this beer will open up in all kinds of ways. It’s one to seek out and at just under 7% it’ll give you a gentle kick in the pants. For more on Old Man Winter take a look at Kevin’s notes on the beer. Now let’s head over to Dublin’s where they’ve got a few new things going, including Dogfish Head’s strapping Belgian Strong Ale, Raison D'Etre and Tyranena’s Sheep Shagger Scotch Ale. These are both malty, warming brews and they make a nice fit when you follow one with the other. The boozy, toffee and caramel aspects of the D'Etre dovetails well with the smokey notes of the Shagger. It’s kind of like following dessert with a cigar. Time to stumble over to Festival foods where there are a number of relatively new bottles of interest. They’ve had both beers from Big Bay Brewing on hand for a few weeks now and I finally broke down and bought some. 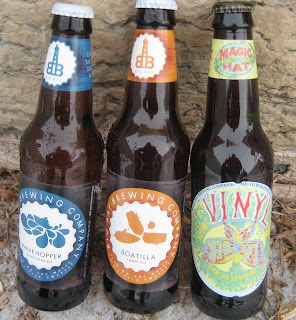 Big Bay is based out of Shorewood and brew their beer at the facilities of the Milwaukee Brewing Company. I read an article about the company in the Journal-Sentinel shortly after their start-up that left me with the impression that maybe these folks are more about marketing than beer. Slugging down their Wavehopper Kolsch and Boatilla Amber Ale didn’t do much to alleviate my suspicions. The Kolsch is the better of the two with a bready nose followed by a touch of DMS and a twang of Cascade hops in the finish. The Amber is utterly indistinct. There’s nothing here to offend, but nothing that’s going to keep you coming back, either. I can’t imagine reaching over anything by O’so, Central Waters or New Glarus to get to this. Just down the isle at Festival there’s something a little more interesting. The Magic Hat Spring seasonal Vinyl Lager is in and like all the Magic Hat brews they’ve cloaked it with a pointless obscurity that promotes little more than confusion. Well, they got me. I took a quick look at the label and thought it was Vaginal Lager. So I bought it. Imagine my disappointment when I got it home. All that aside, I kind of like Vinyl Lager. It pours like a Bock and smells like a loaf of rye bread. It has a very pleasing and mellow malt character that goes well with its trailing bitterness. A good, steady drinking beer. Another beer at Festival worth throwing your money at is Hinterland’s Maple Bock. This is what a Bock might be if it were re-imagined by the Belgians. It pours to a rich mahogany with a stunning aroma that leads with the maple and then gets around to all sorts of other stuff like cookie dough and caramel. I was expecting it to have a heavy body, but the mouth feel is more like a Belgian Dubbel. It drinks fairly light, though not without a complexity of flavor. The maple is there, but they don’t beat you over the tongue with it and creates a nice grouping with the vanilla and coffee flavors that keep popping up in the background. I thoroughly enjoyed this one. I’ve been warming up to Hinterland in a big way, lately, and this beer cinches the deal for me. I won’t pass on anything they put out. Just one more... I got hooked on Sprecher’s Winter Brew about a month ago when it come on at Oblio’s (at last check it was still pouring there). Now they’ve got a good-sized batch of it at the Northside Pick 'n Save that looks like it’s going nowhere fast. This is an excellent Munich style Dunkel Bock that’ll warm the innards of any lover of lagers. It’s a rich and full-bodied brew that’s perfect for a cold winter night. We’ve got no shortage of those in store, either. Stock up on this and watch that temperature dip. After a few nips it’ll be warm as July. Happy tippling! Now that the atmosphere has cleared of the holiday-season debris, it’s time to turn our attention to events that really matter. Such as beer festivals. The first of the 2011 season will be the 2nd Annual Fond Du Lac Brewfest slated for Saturday, February 5, 2011. That may seem a bit distant, but like last year’s FDL Brewfest, this year’s event will sell-out so the time to set your plans and get your tickets is now. And that’s easy enough to do. In Oshkosh, just head over to O’Marro’s Public House where you can nab a ticket and sign up for the bus that’ll happily haul your sotted bulk down to Fond du Lac and back. Visit the Fond Du Lac Brewfest website for all the pertinent info and while you’re over there take a look at the breweries they’ve lined up. The emphasis is on small, Wisconsin breweries who’ll be pouring beer you probably haven’t tried before. For example, take Black Husky Brewing - a nano-brewery located outside of Pembine in Northern Wisconsin. Black Husky makes great beer that’s virtually unavailable outside a 30 mile radius of their brewery and they’ve promised to brew a couple special beers just for this event. This is the kind of thing that makes a beer festival worthwhile. See you there! Here’s an incredible picture that Oshkosh historian and author Dan Radig has been kind enough to share with us. This was the saloon of Adolph Baier located at the southwest corner of Ohio Street and 7th Ave. Baier was born in Austria and came to Oshkosh in the early 1880s. While also working as a wagonmaker for A. Streich & Bros., Baier ran this saloon out of his home at what would now be 601 W. 7th Ave from approximately 1892 to 1898. The two corner signs on the building give us a clue to the date of the picture. The top sign is for the “Celebrated Lager Beer” of Lorenz Kuenzl’s Gambrinus Brewery. The lower sign is for Horn & Schwalm’s Stock Lager. After 1894 these two breweries would merge with The Union Brewery to form the Oshkosh Brewing Company, so in all likelihood, the image pre-dates 1894. Gathered at the front of the saloon are, presumably, the Baiers. 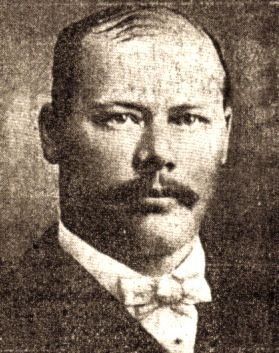 Adolph Baier and his wife Mary would eventually have nine children making this a somewhat early incarnation of the family. And look at all those beer barrels lined-up along the east wall of the home/saloon. Wouldn’t you love to know what the beer in those barrels tasted like? Amazingly the Baier home is still standing and it’s in pretty good condition considering the years of use it has endured. If this is the sort of thing that fires your interest then you’ve got to check out Dan’s new book, Oshkosh Grocers of the South Side 1857-1978. 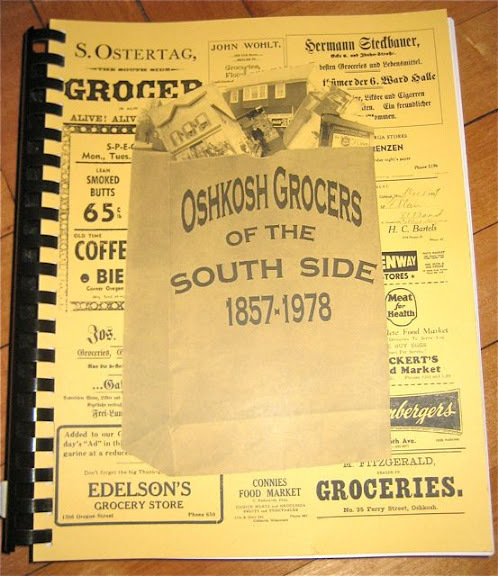 It’s a jaw-dropping compendium of Oshkosh history that uses the hundreds of small grocers that once operated in Oshkosh as bellwethers for the change and development that has shaped our city. Dan says the book started as a “simple list of markets in town to use as a quick reference source and it spiraled out of control.” No kidding! At 668 pages this is the result of the best kind of obsession. It’s the sort of book you fall into and come up an hour later wondering where the time went. 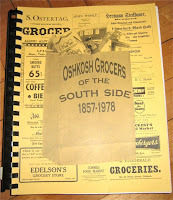 Oshkosh Grocers of the South Side 1857-1978 is currently available in Oshkosh at Apple Blossom Books and will also soon be in stock at Sister's Restaurant.